Jerusalem Police still banning Jewish prayer on the Temple Mount - but there are many reasons to hope. This week, the people of Israel will read the final two Torah portions of the book of Exodus, Vayahkel-Pekudei, and as Exodus draws to a close, congregants will recite aloud the traditional "Be Strong, Be Strong, and Let Us Be Strengthened" which marks the conclusion of each of the five books of Moshe. This Shabbat is also the third 'special Sabbath' that precedes Passover: Shabbat Para, the Sabbath of the Red Heifer, which is marked by the special Torah reading of Numbers 19. 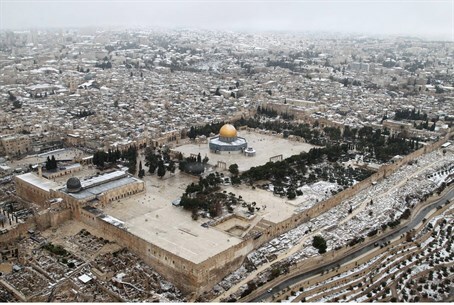 In this week's edition of Temple Talk, Yitzchak Reuven and Rabbi Richman unravel the thread that connects these Torah portions with the Red Heifer and the events currently unfolding on the Temple Mount. It's all about the will power and desire of the people of Israel to make G-d's dream come true. There were no excuses when it came to building the tabernacle in the desert; what's our excuse today? Indeed, don't miss this week's Temple Talk, which resounds with the message "Be strong, be strong, and let us be strengthened!" And: The sixth annual international Temple Mount awarness day broadcast is coming soon. This year's theme: everything you always wanted to ask wanted to ask about the Temple Mount and HolyTemple. Rabbi Chaim Richman and Yitzchak Reuven will be answering your questions in depth! Have a question about the Temple Mount? The Holy Temple? The Divine service in the Holy Temple? Now is your opportunity to ask!